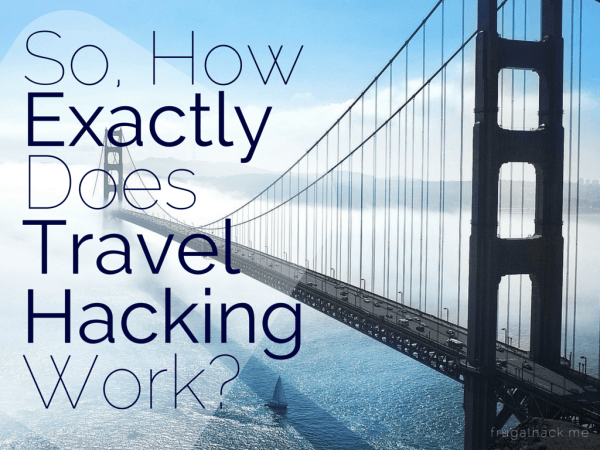 » So, How Exactly Does Travel Hacking Work? Travel hacking is a hobby like no other. It’s not just an enjoyable pastime that keeps you busy, but it often leads to once in a lifetime experiences for pennies on the dollar. Is it a scam? No. Is it illegal? Absolutely not. It’s simply a beautiful way to take advantage of the system, per se. I’m sure you’ve heard the phrase “travel hacking,” “travel hacks,” travel hacker,” or some sort of “travel” plus “hack” combination in the blogosphere somewhere. After all, the points, miles, and travel community is huge, just look at all these points and miles blogs. But, what does it all mean? What is travel hacking and how can you hack your travel? Hit the break to find out. Travel hacking is a general term used to describe the process of using the system to your advantage when/for traveling. There’s no set definition for the phrase, it’s simply used to describe anything from manufacturing spend to booking mistake fares to finding award travel. In other words, it’s a coverall phrase. How Do People Travel Hack? There are many ways to hack your travel, so many so that it’d be impossible to cover them all in one post, thus I’ll only be touching on a few. It should come as no surprise that credit cards and manufactured spending play a big role in travel hacking. In fact, I would say it’s one of the biggest methods of hacking travel. How is that, you ask? Well, credit cards provide a lot of travel related benefits, such as waived checked bag fees, rental car insurance, trip cancellation protection, and much more. Without credit cards, travel is, uh, more difficult. Manufactured spending is a beast in and of its own. It’s main purpose is to make hitting credit card sign-up bonuses as cheap as possible, yet often times it’s not only used for just that, it’s leveraged as an additional points and miles earning tool even when not churning. Manufacturing spend for cash, points, and miles is a great way to travel hack by making the cost of travel significantly cheaper, but the real art is the award booking. Award travel is the process of using points and miles to book flights, hotels, and other travel related activities and transportation. It’s one of the cheapest ways to travel, but it’s also one of the most difficult ways as well. Award travel and manufactured spending go hand in hand. They both are great by themselves, however when you put them together, travel hacking becomes even easier. After all, without manufactured spending, points and miles could only be earned from actually paying for travel and without award travel, manufactured spending would only be useful for cash back. One without the other, is just not as beneficial as both. Mistake fares are some of the easiest ways to travel hack since there’s no real skill to it, human interaction, or work involved. They just require you to be mindful of the deals and jump on them ASAP, because they don’t last long. I have yet to book a mistake fare, not because I’ve missed the deals, just because it requires A LOT of flexibility, which I don’t have currently. Mistake fares are exactly what they sound like, mistakes. You never know where the flights will fly out of or fly to at any given time, however if your flexible and you watch for deals, mistake fares are a great way to travel hack. As I mentioned above, there are many ways of travel hacking. For example, you could skip a leg on your trip, do some mileage/mattress running, or something entirely different that no one has thought of yet. There’s no right or wrong way of travel hacking, it’s just a matter of figuring out what works best to save you money on your travels. You’ve probably heard about travel hacking, manufactured spending, flying for free, and all the other amazing things people in this industry are doing, but how do you do that yourself? It may sound like a daunting hobby, which in some ways it is, yet once you get the hang of it, it’s actually much easier to grasp than you may think. Here’s how you can start your travel hacking career, or at least start the learning process of your travel hacking career. Determine if you should manufacture spend. If you decide that manufactured spending is something you can see yourself doing, learn everything you can about it. Once you’ve learned about manufactured spending, get some credit cards. Don’t just sign-up for the first ones you see, but research them or just contact me and I can suggest some for your travel goals. Read: How Many Cards Should You Sign-Up For? After you have your cards, you’ve manufactured the spend, and you’ve earned your points, it’s time to start looking into award travel. Award travel, in addition to manufactured spending, is always changing… always. Because of that, you’ll never be able to master it, but you can at least try. I suggest checking out Travel is Free, Flyertalk, and all the points and miles blogs you can find. There is a lot to award travel, meaning you need to research it in-depth. Now book your award travel and enjoy your trip you travel hacker you. Alternatively, look out for mistake fares, mattress running deals, and other travel hacking deals. The best way to do that is simply by keeping up with Flyertalk and blogs. There’s no one stop convenience blog, but it you just put a bunch of them in your Feedly, you should always know about the next big deal. Travel hacking is an art, more or less. It’s the process of taking a canvas (travel) and manipulating it in a way that earns you the most travel (hotels, flights, ect.) for the least amount of money. Is it a challenge to learn the ins and outs? Absolutely, but that’s the case for almost all hobbies. The best suggestion I can give is to stick around a while, research your eyes out, and, eventually, travel freely.